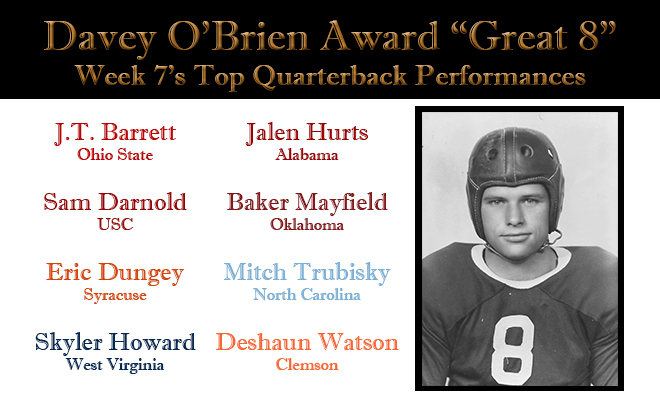 FORT WORTH, Texas (Oct. 17, 2016) – Of the eight quarterbacks named to this week’s Davey O’Brien “Great 8” list, seven are multi-time honorees this season. In addition, two of the three finalists for the 2015 Davey O’Brien National Quarterback Award are included. The eight honorees, as determined by voting from the award’s selection subcommittee, include: J.T. Barrett of Ohio State, USC’s Sam Darnold, Eric Dungey of Syracuse, West Virginia’s Skyler Howard, Jalen Hurts of Alabama, Oklahoma’s Baker Mayfield, Mitch Trubisky of North Carolina and Clemson’s Deshaun Watson. Hurts resides on the list for the fourth time this season, while Barrett and Trubisky are each appearing for the third time. Darnold, Howard, Mayfield and Watson are all honorees for the second time this year. In all, the eight players have earned the distinction a total of 19 times in 2016. Led Ohio State past No. 8 Wisconsin, 30-23 in overtime, going 17-for-29 for 226 yards and one touchdown, with 92 rushing yards and two scores. Threw five touchdown passes, completing 20 of 32 attempts for 235 yards, and also ran the ball six times for 54 yards in a 48-14 win over Arizona. Eric Dungey, Syracuse, So., 6-3, 207, Lake Oswego, Ore. Keyed a 31-17 upset of No. 17 Virginia Tech by passing for more than 300 yards (28 of 53, 311 yards, 1 TD) and topping 100 yards rushing (24 carries, 106 yards, 1 TD). Was 21 for 31 passing for 318 yards and one touchdown and totaled 89 rushing yards and two scores on 12 totes in a 48-17 victory over Texas Tech. Rushed for 132 yards and three scores on 12 carries and added 143 passing yards (16 of 26) in Alabama’s 49-10 triumph over No. 9 Tennessee. Had just six incompletions (25-for 31 passing, 346 yards) while throwing four touchdown passes in the Sooners’ 38-17 victory over Kansas State. Completed 33 of 46 passing attempts for 299 yards and two scores and rushed 13 times for 47 yards in the Tar Heels’ 20-13 upset of No. 16 Miami. Connected on 39 of 52 passes for 378 yards and two touchdowns and had 13 carries for 35 yards and a score as the Tigers defeated NC State, 24-17.